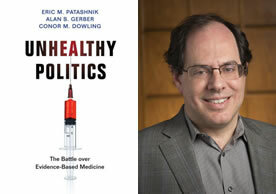 CSAP director Alan Gerber along with co-authors Eric Patashnik (Brown University) and Conor Dowling (University of Mississippi) will receive the 2018 Don K. Price Award for their book Unhealthy Politics: The Battle Over Evidence-Based Medicine (Princeton University Press, 2017). In this timely volume, the authors describe how partisanship, polarization, and medical authority stand in the way of evidence-based medicine in the United States. The Don K. Price Award recognizes the best book on science, technology, and environmental politics published in the last year. It is one of several awards bestowed by the Section on Science, Technology & Environmental Politics (STEP) of the American Political Science Association (APSA) to recognize outstanding scholarly achievements in the field. The award presentation will take place at the STEP section business meeting during the annual APSA conference being held this year in Boston on August 30 through September 2. Alan Gerber is the Dean of the Social Science Division of the Faculty of Arts and Science, the Charles C. and Dorathea S. Dilley Professor of Political Science, Faculty in Residence at the Institution for Social and Policy Studies, and director of the Center for the Study of American Politics at Yale University. His current research focuses on the application of experimental methods to the study of campaign communications, and he has designed and performed experimental evaluations of many political communications programs, both partisan and non-partisan in nature.